My family came to visit New York for the first time ever. We don't see each other very often since they live in Texas, but it was my birthday last Tuesday so we celebrated together. We went to the 9/11 memorial, took the staten island ferry to see the statue of liberty, went to the rockefeller center, ate soup dumplings in chinatown and gelato in little italy. It was truly the best birthday I've had in a while. I took them to all my favorite restaurants. They also had a lot of firsts when it came to food: chopped liver, hipster thai food, halal truck lamb and rice. My dad raved about this amazing scallop ceviche we had, though I'm pretty sure he doesn't know what "ceviche" means—all that matters is he loved it. The meals we shared together were so carefree, and I was just happy to see them happy. At the end of each day we were completely beat from all the walking, but also the insane heat + humidity. This weather has been ridiculous lately. Just ridiculous. My mom and brother even called an audible during their last full day here and went back to the hotel early in order to cool down. As of Friday, they escaped this heat wave by going back to Texas...where it's cooler right now. 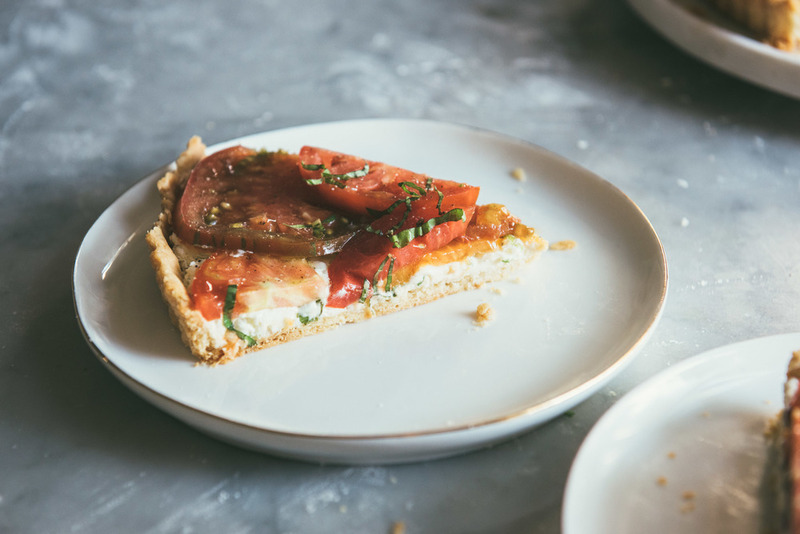 It's only appropriate that the recipe I'm sharing today is a fresh tart made with uncooked tomatoes and a smooth, cool filling of goat cheese, ricotta, and scallions. It makes a great addition to any summer dinner party, but is no less enjoyable if you're dining alone. Either way, it's a good meal to beat the heat. Enjoy and stay cool! Since this recipe highlights a few key ingredients, quality is extremely important. I recommend using in-season heirloom tomatoes and fresh ricotta (ideally homemade if you have the time, it's much easier than it sounds—takes less effort than going to the store imo). If this tart isn't gone the first day, you can store it, covered, in the fridge for 3 to 4 days. Because sliced tomatoes don't stay fresh for long, I recommend popping leftovers in the oven (it changes the taste, but is still delicious). Makes one 10 to 11 inch tart. Make the dough by placing flour, salt, and sugar in a medium mixing bowl. Whisk to combine. Add the butter and shortening. Using a pastry blender, cut the fats into the flour until they are the size of small peas (the more visible pieces of fat the better!). Add ice water and mix lightly with a spoon or spatula until it starts coming together. Turn the dough onto a lightly floured counter and knead a few times with your hands then form it into a ball. Wrap the dough tightly in plastic wrap and refrigerate for a minimum of 1 hour and up to 1 day. When ready to bake, turn the oven to 350 degrees F. On a well floured counter, roll the dough out until it can fit a 10 to 11 inch tart pan. Gently transfer dough to the pan and press it in. Trim off any excess then poke some small holes evenly along the bottom using a fork. Line the dough with a sheet of parchment paper then fill it with pie weights (or uncooked beans/rice). Transfer to the oven and bake for 20 minutes. Take the crust out of the oven, then remove the weights and parchment paper. Return the crust to the oven for another 15 to 20 minutes until the edges are a rich gold and the center is beginning to brown. When the crust has cooled to room temperature, carefully remove it from the pan. Mix the ricotta, goat cheese, and scallions together until smooth. Spread the filling on the bottom of the crust. Layer the sliced tomatoes on top. Salt and pepper the tart to taste, then add a drizzle of olive oil. Garnish with fresh basil. Enjoy immediately.